John Lay is the 8th great-grandfather of Richard, James, Gary, Lisa, Carl, Jane, Bruce, Cathy, Ron, Stacey, Matt and Sandy; and the 9th great-grandfather of Asher, Owen, Caitlyn, Becky, Emily, Jack, Jill, Jordan, Mike and Brian. 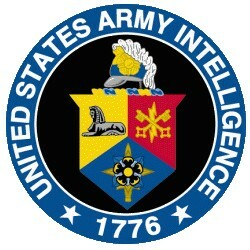 The “1776” on the seal of the United States Army Intelligence Service refers to the formation of Knowlton’s Rangers. American military intelligence has its origins in the formation of the first American Army unit solely organized for the purpose of collecting intelligence, Knowlton’s Rangers. The Rangers were created by General George Washington himself in 1776 and named for its commander, Lieutenant Colonel Thomas Knowlton. Knowlton’s Rangers was comprised of 120 hand-picked men from Connecticut, Rhode Island, and Massachusetts regiments for “special, delicate, and hazardous duty”. In this regard, they were America’s first elite troops, analogous to a modern special forces unit. The Rangers’ mission was to act as a scouting unit for the Washington’s Continental Army, probing British positions and gathering intelligence to be reported back directly to Washington on the enemy’s movements and intentions. One of these hand-picked men was John Lay of Lyme, Connecticut. John Lay was born in Lyme, Connecticut, on December 29, 1737, the son of John Lay (1714-1792) and Hannah Lee (1720-1784). The elder John was a representative to the General Assembly and Lyme’s Town Clerk; during the French and Indian War he served as a lieutenant. The younger John married Anna Sill (1742-1826/1830) on February 28, 1760, at the First Congregational Church in Lyme.. Their first child, Daniel, was born in 1761, and was followed by Filkin (1762), John (1764), Hannah (1767), David (1769), Mary (1772), Abner (our ancestor; 1774), and Lucinda (1777). John enlisted from Lyme in May 1775 as a private in the First Company of Colonel Parson’s Sixth Connecticut Regiment, First Continental Line, being discharged as a corporal in Roxbury, Massachusetts, in December 1775. John subsequently enlisted in 1776 with Lt. Colonel John Durkee’s 20th Continental Regiment. It was at the Battle of Bunker Hill in June 1775 where Captain Thomas Knowlton’s distinguished service came to the attention of George Washington. During the subsequent siege of Boston in 1776, now-Major Knowlton and 200 men from Durkee’s Regiment were sent by Washington to burn the remaining buildings at the base of Bunker Hill, and to capture the British guard. Knowlton accomplished this mission without firing a shot or losing a man. On August 12, 1776, Knowlton was promoted to Lieutenant Colonel and commanded to form an elite independent intelligence and special operations unit. John Lay was among those selected to serve in Knowlton’s Rangers. On September 16, 1776, the Rangers were scouting in advance of Washington’s Army at Harlem Heights, New York. They stumbled upon the Black Watch, an elite Highlander British unit with an attachment of Hessians. They managed a successful retreat but re-engaged the enemy with the support of a unit from Virginia. General Washington ordered the units to fall on the enemy’s rear, while a feint in front engaged the British troops’ attention. An American premature shot into the right flank of the British ruined Washington’s plan and placed Knowlton’s Rangers and the Virginians at risk. Knowlton rallied his troops to carry on the attack, but he was killed in the ensuing fight and Washington’s army was forced to retreat. 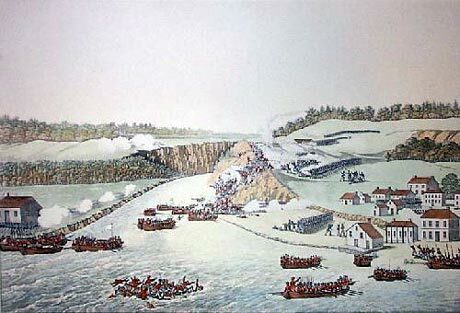 After defeating the Continental Army at the Battle of White Plains, the British Army forces under the command of Lt. General William Howe planned to capture Fort Washington, situated in what is now Bennett Park in the Washington Heights neighborhood of Manhattan, just north of the George Washington Bridge. Washington had issued a discretionary order to General Nathanael Greene to abandon the fort and remove its men to New Jersey. Colonel Robert Magaw, commanding the fort, declined the order, believing the fort could be defended. On November 16, 1776, Howe led an assault on Fort Washington from three sides: the north, east and south. Tides in the Harlem River prevented some troops from landing and delayed attack. When the British moved against the defenses, the southern and western American defenses fell quickly. American forces on the north side offered stiff resistance to the attack, but they too were eventually overwhelmed. With the fort surrounded by land and sea, Colonel Magaw chose to surrender. A total of 59 Americans were killed and 2,837 were taken prisoner. 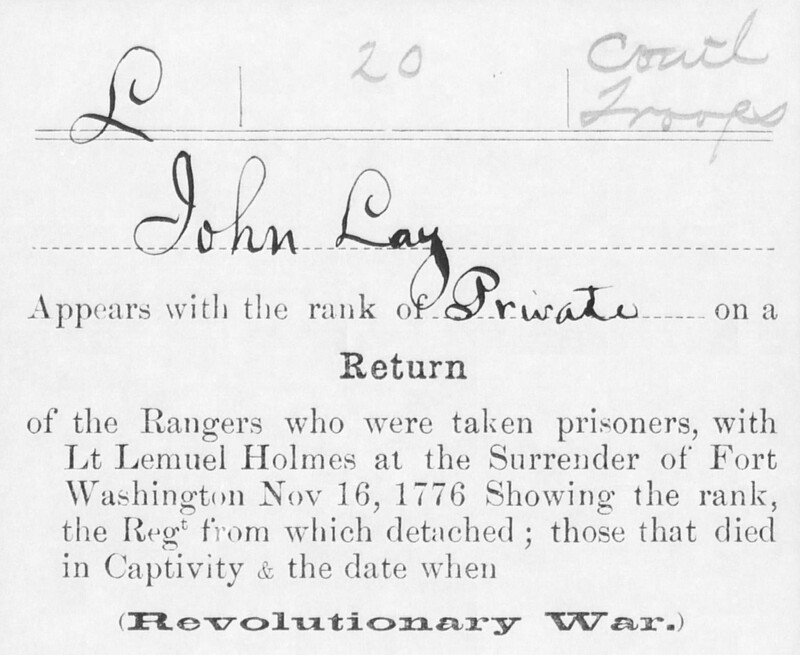 Most of Knowlton’s Rangers, who had arrived at the fort shortly before Howe’s attack, were captured, including John Lay. 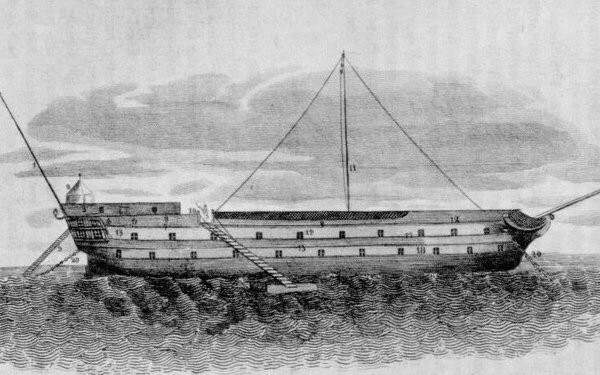 The prisoners were sent to the infamously squalid and brutal British prison ships that lay anchored in New York Harbor. Many of the prisoners died of malnutrition or disease, but John Lay survived to be released in January 1778 in a prisoner exchange. After some time to recover with his family in Lyme, John enlisted again on July 1, 1780, and served until his discharge on January 1, 1784. Altogether, John saw active duty during the American Revolution for more than six years. John Lay died on January 8, 1813, at the age of 75 in Lyme, Connecticut, and was buried in the Old Meeting House Hill Cemetery there. John’s teenaged son John also served during the Revolutionary War as a private in Capt. Enoch Reed’s Company, Col. Zebulon Butler’s Connecticut Regiment, from January 1781 to October 1783.